Thanks to a friend on Facebook and this article, I am trying out the new "Timeline" feature that will be hitting Facebook in early October. I have to say, it is DIFFERENT! Now, I am not a fan of change... not one bit. I find security in the same ol' same ol'. This one is fairly neat... I am still going to be a little resistant, though. Here's a screenshot of my NEW Facebook profile page..
See the new "Timeline" feature. 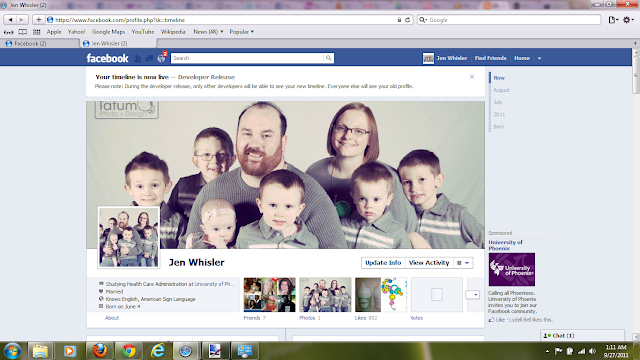 This is definitely a new look for Facebook profiles.... what do you think? Will you like it? One thing that makes me a little hesitant about this change is the privacy concerns any new changes bring to a social neworking site. Will the new changes create loopholes for hackers, yes, more than likely... so I hope Facebook will be on their toes and get them all fixed quickly when they do come about. Leave me a comment, I would love to hear what you think of the new Timeline feature that will be coming to Facebook in early October! Ugh- No more Facebook updates! I have a theory, that they are trying to confuse old over-thirty folks like myself, so we leave Facebook and it's only young, trendy people using it. Lol :) - but only kind of. Here's my thoughts- Everyone used MySpace and loved it, until they started messing around with it, doing "upgrades", and no one liked it anymore. Please, my beloved Facebook, don't change into someone you're not, and cause us to break up?! Change just for the sake of change is silly, and I feel like that's half of what fb does- so many small tweaks seem to have no point. I'm really unsure about the change you show here- it seems like a lot of wasted space, tons of extra scrolling. Plus, if they're going to do changes, it should happen all at once, not one change, another big one a couple weeks later, then some more right after, right? I don't really like the most recent changes, they're confusing. And the constant update of every tiny thing everyone is doing on FB is annoying and I feel weird knowing everyone is getting updates of what I'm up to. But the upcoming changes look neat. I think they'll perfect everything. If everyone hates something, they'll most likely improve it. I'm sure everyone will catch on and get used to the changes after a while... If not, G+ is becoming pretty big, maybe the masses will switch over to that. Get copy of Harris County Bankruptcy Records. Bankruptcy live .com has came into existence to help consumer and business filer to get their respective credit standing restored after getting discharged from bankruptcy case. OK... 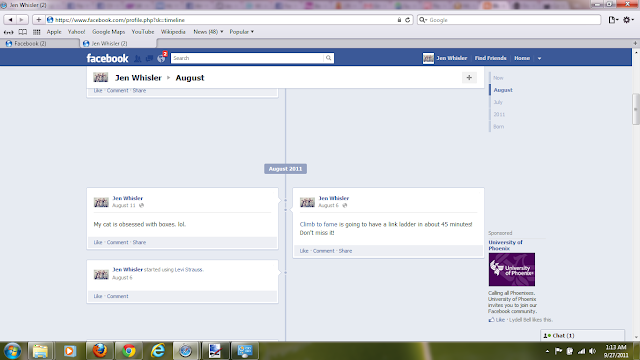 I'm not typically a big fan of change either, but I love the idea of the Timeline feature! I find myself frequently going back and searching through my status updates to see when things were happening, whether it is for documentation in a baby book, for my blog, or for the journal I'm working on for our new baby expected in March. The timeline will be so helpful and save so much time! Yes!